Nere cast a clout till May is out! Well we needed waterproof “clout” to go sailing as the wind was blowing old boots. 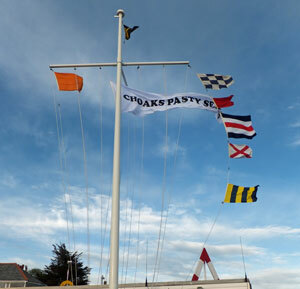 The race officer Mel Sharpe made an early decision to cancel all open boats for the second of two Choaks Pasties series. The wind was Northerly 35kts gusting 40 kts at 1430 but showed a steady downward trend toward the forecast 20 kts at 1800. Eight Q class yachts bounced around with reefed mainsails and reduced genoas before the start. The committee boat was on the eastern side of the Narrows and the pin end was on the western side so that both had shallow water to anchor. Q class all elected to start on Starboard tack, cross the line and head for the Trefusis shore for flatter water and less ebb tide. Five U class yachts bashed around in the choppy waters and started 5 minutes after. On Trifle we had a reefed main and no 2 genoa but with just Matt and myself felt a little hard pressed at the start. We tried to do a port flyer but got mixed up with the others coming up on starboard. We tacked to avoid Moonlighter, Paul Collins and then missed the pin. Moonlighter hit the pin and also had to reround for her start. Wilkie, Bob Chapple went off like a long dog and Deep Purple, Ron Jones followed hard. Mary Boon, John Cruise who had similar start ideas as me had to bear away to avoid us at the start and was late starting as well. The wind had backed North West and all classes had a good thrash beating up to Mylor Yacht Harbour PW buoy left to port. Sweet Friday, Len Cheshire was joined in W class by Amneris, Mike Robson. On rounding the buoy U class and W class bore away to W north of St Mawes castle to take to starboard. Spinnakers popped in Q class and Encore, David Cunliffe later told me he was doing 10 kts heading for Carricknath to starboard. I also saw a white assymetric kite, which could have been Elsa, Tony Statham or Origin, Andy Dennis. Once they rounded Carricknath Q class had a good beat back to Trefusis buoy to port. U and W class then went back to Vilt rounding to port and certainly in Trifle we found the short chop hard on our short waterline. Wilkie forged an ever-greater lead and Moonlighter got mixed up with Deep Purple. We were 4th around the buoy with Mary Boon bringing up the stern. Amneris in W class got ahead of Sweet Friday and Len later told me he was slightly under canvassed. Q class headed back down the roads and had to round Black Rock buoy to starboard and finish at FSC. U and W went for Pendennis mark just north of Black Rock. On Trifle we elected to push dead downwind and made a significant gain overtaking Moonlighter just before the buoy. That was almost it other than a long beat up the harbour to the finish. Wilkie won by a good margin and Mary Boon last on the water took 54 seconds out of Trifle on handicap to beat her into 2nd place. Amneris beat Sweet Friday. Origin beat Excelle, John Fox into 1st place with Encore coming 3rd in Q class. As it is a two race event the overall results can be found on the website. We went back to a quiet clubhouse and had our sailing supper. Thanks to Kay Price and Jeannette Hill on the committee boat along with Mel Sharpe and his crew. Inez Thompson ably assisted by Jack Penty in the ops room and Sue Clark for processing two lots of results. Jenny Chivers the barmaid and Giles duckman Butcher the boat man, father to “Puddles” who is growing away! Last but by no means least to Charles Choak for his kind sponsorship of the series.